I Love A Clean San Diego challenges San Diegans to take an active role in protecting our environment. To celebrate Earth Day, gather family and friends to participate in the 8th Annual Creek to Bay Cleanup on Saturday, April 30th from 9AM – 12noon. 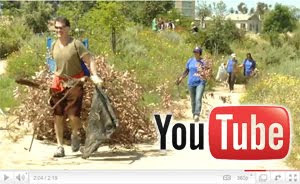 Volunteer alongside 5,000 others to preserve San Diego’s natural heritage. Take pride in our treasured outdoor areas by volunteering at one of 68 coastal and inland cleanup sites countywide. Registration information and site details are available online at www.creektobay.org.